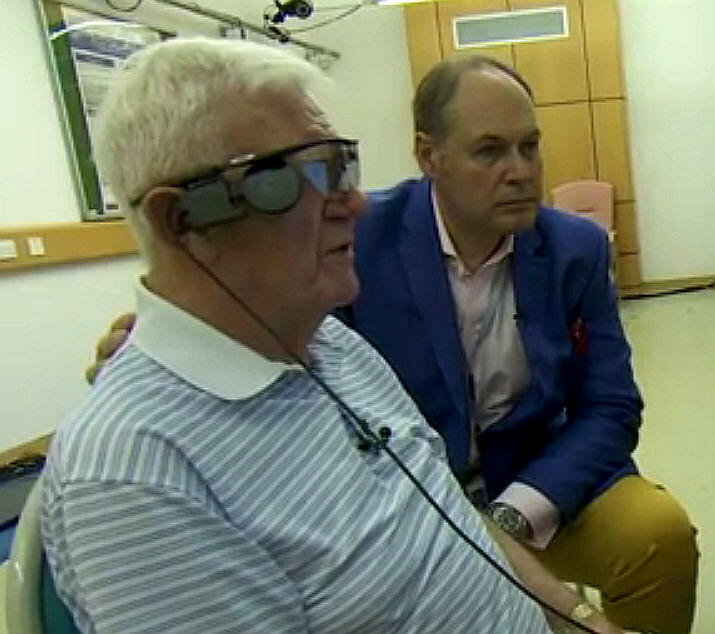 The UK’s first bionic eye implant has been successfully completed in Manchester. The Argus II Retinal Prosthesis System has been developed to compensate for macular degeneration, an age-related deterioration of the light-sensitive layer inside the eyeball. Although the Argus II is manufactured by US company Second Sight, it was developed by Paulo Stanga, professor of ophthalmology and retinal regeneration at the University of Manchester. In the US, the eye implant has been used to give limited vision to blind people suffering from a rare condition known as retinitis pigmentosa but this is the first time it’s been used for patients with dry, age-related macular degeneration (AMD), an untreatable condition which affects at least half a million people in the UK. Patient Ray Flynn, aged 80, was operated on last month at the Manchester Royal Eye Hospital. His central vision had been lost due to dry AMD but he still retained peripheral vision. Prof Stanga led the four hour operation and has described Flynn’s progress as “truly remarkable”. The resolution of the implant is not high and comprises an array of 60 electrodes, but it creates patterns of light which patients can learn to interpret as visual patterns. Initially, miniature video camera housed in the patient’s glasses captures a scene and the signal is sent to a small computer worn by the patient. This video processing unit converts the image into a signal which is transmitted wirelessly to the electrode array in the patient’s eye. The array then transmits small pulses of electricity which stimulate the retina’s remaining cells to send a signal to the optic nerve. After just a few weeks, Flynn can recognise the outlines of people and objects and Prof Stanga said that, in time, his patient will become more skilled at determining a wider range of outlines. The hospital plans to treat four more patients and work on the implants will continuing to increase the image resolution. Experiences of Second Sight’s patients suggests that colour vision may not be out of the question.